• Blue, which corresponds to the Willpower of God. This Fire has the qualities of the Father. The Blue flame gives us the faith and the ability to get things done. Gives you the strength to overcome the must difficult obstacles to achieve your goals. People with a tall blue flame tend to have more physical energy and have more of a mechanical intelligence... Mind over Matter . • Pink, which corresponds unconditional love and understanding that is the very nature of God. This Fire has the qualities of the Mother. The pink flame relates to the emotional feeling body within the auric field. People with tall pink flames tend to have more emotional intelligence. They intuitively understand the impact of their thoughts, feelings and actions upon others. The flame manifests as our ability to learn, understand, process information and reach an enlightened state of peace. It is about learning when to guide, use the right words, not to judge, and not to discriminate. The gold flame directly correlates to the mental thinking body within the auric field. People with a tall gold flame tend to be very stimulated intellectually and are intelligent in a traditional, mental way. Most Spiritual Teaching stresses that you can not get beyond a certain level on the spiritual path until you have balanced your threefold flame. If you misuse one of the three flames (willpower, wisdom or love) your power from the Holy Spirit into your 4 body system is reduced, until you have just enough light to keep your physical body alive. For example, some people have determination and will power, but don't have the wisdom of how to use it for the greater good or to use it without hurting or controlling others. Others have great intellectual understanding, but who lack the ability to get anything done . You also see some people who can easily express love, but end up in codependent relationships because they do not have the power or wisdom to say no. 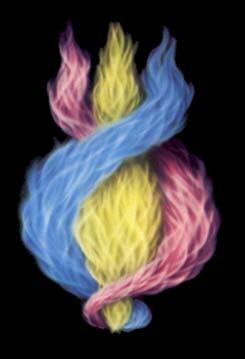 Once your threefold flame is balanced between power, wisdom and love, you can expand your threefold flame into a sevenfold flame that expresses the full potential of your I AM Presence on all seven sacred fires of the Holy Spirit. It is recommend that you do certain exercises designed to open the chakras in order for you to receive a higher frequency of Sacred Fire. For example, Yoga or Tai Chi moves correspond to different chakras, so people may do these exercises while intending to take in a sacred fire color.